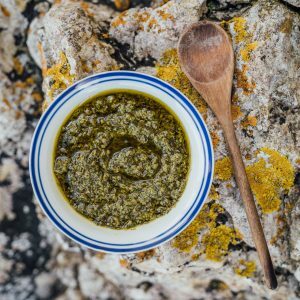 Ocean freshness combined with classic pesto flavours, Islander Kelp pesto contains Kelp (Laminaria digitata - 35%), to produce a superb pesto with a slight ocean ‘twist’. 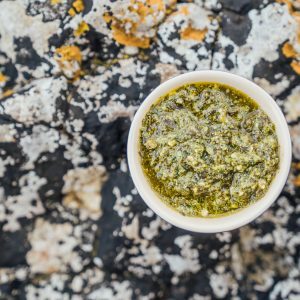 Use as ordinary pesto, drizzle over food, or use as a dip. Ambient and fresh. Great Taste Award Winner * Kelp (Laminaria digitata)(28%), onion, spirit vinegar, sugar, gherkins dill, pepper, coriander, cold pressed rapeseed oil, salt, spices (including mustard & celery), stabiliser (carrageenan (seaweed extract), locust bean gum). The relishes can be used as any relish, but add a particular ocean freshness and can also be used as an ingredient in many dishes. A fresh salsa verde, made with kelp along with salsa verde ingredients. Ready to eat sauce, topping, dressing for fish, roast poultry, grilled meats or vegetables. Come as both an ambient (retail) and fresh (food service) version. Contains anchovies. The kelp tapenade is an outstanding product made with high grade ingredients including kalamata black olives & kelp (Laminaria digitata - 37%). 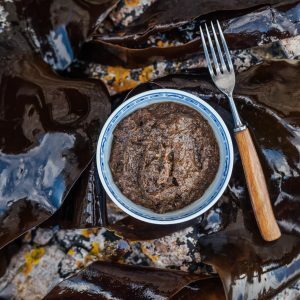 It has a slightly more mellow taste than regular tapenade, but yet the kelp also gives it a freshness on the tongue. Ambient and fresh versions. Contains brandy and anchovies. 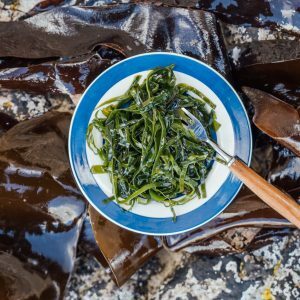 Kelp (Laminaria digitata)(28%), onion, spirit vinegar, sugar, capers (capers, water, vinegar, salt), cold pressed rapeseed oil, ginger, garlic, salt, chilli (0.3%), spices, stabiliser (carrageenan (seaweed extract), locust bean gum). The relishes can be used as any relish, but add a particular ocean freshness and can also be used as an ingredient in many dishes.